There’s a reason we are the leading driving school in Berkhamsted, its because we have a dedicated team and the finest driving instructors that are up to an A grade. We put you at the centre of everything we do, our helpful learning centre is an invaluable tool you wont find with any other school; giving you access to information on manoeuvres, driving test prep, a free driving manual and much more! Berkhamsted has a great variety of roads to get you used to all driving conditions, our instructors will use their extensive knowledge of the area to take you to a diverse range of roads and get you familiar with the all important test routes. The quiet residential roads around Butts Meadow and Velvet Lawn recreation grounds are a perfect place to start, then once you’re ready the A416 and A41 are great for a more challenging experience. I have just passed my driving test with no minors after learning with Paul for 4 months - I have really enjoyed all of my lessons and can't wait to start driving! Amazing teacher, very patient and flexible with lessons. Passed first time with him as my only teacher and felt confident afterwards thanks to his teachings. Paul is a great instructor, he helped me pass first time within 4 months carrying no minors. Nice and calm teacher to learn with. Thank you very much for make my day Would recommend. Very calming and casual with students, an attitude which greatly helped me progress. Choice sometimes to stop the student and slow everything down makes things easier. Would recommend! 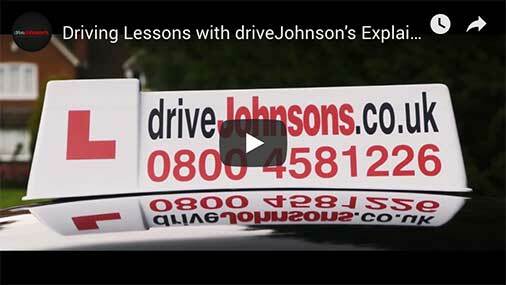 Drive Johnsons is a good driving school, but the best driving instructor is Paul, very patient and a very good teacher who helped me to pass my test. Strongly recommended! Paul was a very pacient instructor, and it took a while but he helped me pass. He's a calm instructor and goes over anything that you might struggle with. Paul has been a great instructor, easy to arrange lessons with. Very easy to get along with and made me feel confident as a driver and I passed first time, highly recommend! Great instructor, passed 1st time within 6 months. I would definitely recommend Paul. A great driving instructor with a lot of patience. Passed on the second attempt. Paul is very friendly and helpful- he was flexible with booking lessons around my work schedule, and helped me get up to speed really quickly (no pun intended) and was able to pass on my first attempt. Thanks Paul for all the help! Paul is an excellent driving instructor who helped me pass my test first time. He is very patient and he helped develop my confidence on the road. Would highly recommend to all learner drivers. Didn't get along with my old instructo, changed to Paul and he's helped me pass first time. Would recommend. Great instructor, helped me through my test and amazing man!! Can’t thank him enough! Passed my test first time with only 3 minors after just 4 lessons with Paul, he's a great instructor and a really nice guy. Good instructor passed on my third go, addressed every problem after failing and worked out to be a good teacher and generally a nice guy, drive johnsons is the way. Paul is a fantastic driving instructor. Having had troubles with a previous instructor, paul helped me restore my confidence (something i struggle with the most) and enabled me to see my own faults and find ways to resolve them. Paul put my mind at ease and made me believe i can do it. A very big thank you for all your help. A really great instructor and all-around nice guy. Paul showed great patience and helped me loads in in increasing my confidence on the road. He identified my areas of weakness and focused on turning them into my strengths. Always pleasant and friendly to drive and chat with. Took me from being a very nervous novice to a confident road user looking forward to spending more time behind the wheel. Just passed my test on my second attempt and think I'm really going to miss my weekly lessons now. Would definitely recommend Paul to any prospective learners.